I don't know if you guys know. I'm a geek. I love Marvel, Doctor Who, Star Trek, Star Wars--and I'm always open to something new. 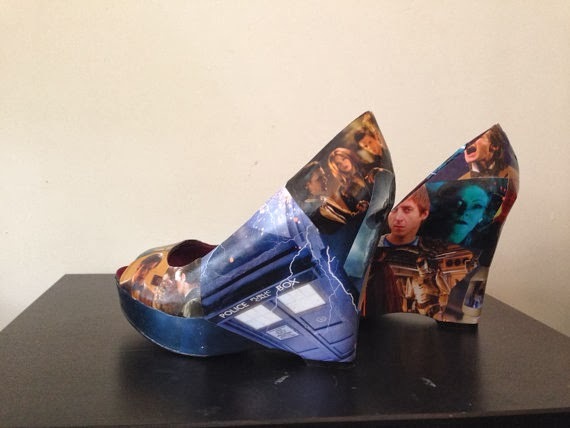 I was surfing Etsy the other day, looking for Doctor Who products worthy of my buck when I cam across some really fantastic looking shoes. I saw these and I was like, "AAHH! Man, they're cool!" I had to find out what else the artist designed, and preferably--get to know a little bit more about her. Here she is! Hi Jodi! Thanks so much for doing this interview. 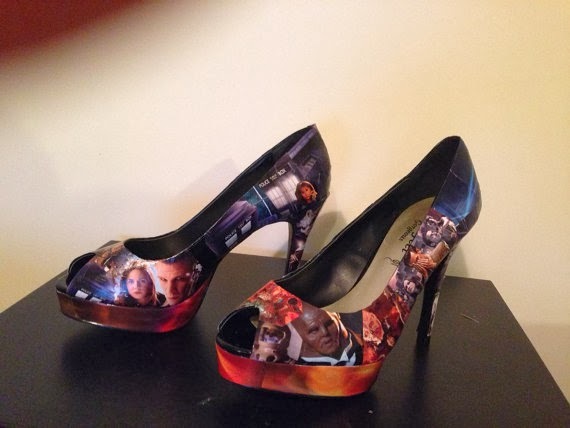 As a nerdy fan-girl, I was so excited to see something as cool as those Doctor Who heels. The work looks incredible. It led me into looking at your other work. 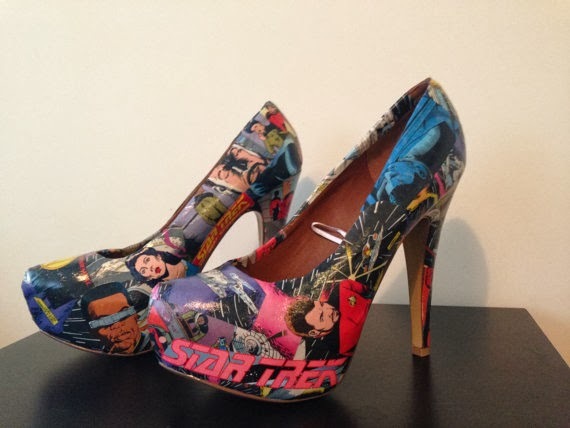 What began your love of Marvel, Doctor Who, etc.? I've loved comics from an early age, I was a very solitary child so I revelled in fiction wherever I could find it. My love for American sci-fi was huge and then as I got older the new series of Doctor Who in my own country got me hooked. I've always been obsessed with Superman, my collection is huge and always growing, as for me being a 'Trekkie' and designing my own star trek shoes, well that's all down to my dad. We watched it together all the time while I was growing up and it just never stopped. He also got me into Red Dwarf too which I'll always thank him for, they'll definitely be a pair of Red Dwarf shoes making an appearance in the near future. How did that transition over into a making fan products? I'm not a shoe person believe it or not, I don't like girly shoes or sparkly heels of any kind. My shoe collection consists of everyday slip ons or if I'm going out my Iron Fist collection. For any one that's not familiar with the brand, they are more alternative foot wear. I get a lot of attention when I wear my bright green zombie stompers lol. Anyway, I got tired of looking for a pair of shoes that were not plain and boring or even covered in glitter. So after finding a few pairs on the internet I decided to try and make my own. I got a lot of interest from friends and people I didn't even know on nights out which gave me the idea to make more and sell them on. Fortunately for me I have very helpful and generous mother-in-law who helped me along the way. She brought me a pile of shoes in all styles and sizes to get me started, even now she rings me up while she's shopping to see if I need certain books or materials. Can you tell us about your process? Of course I will understand if you're very discreet about your secrets. What should the customer expect when ordering? Most of my customers ask for custom made shoes, I had a lady the other day ask me for Cinderella, a football logo and lily flowers all on one shoe. I'm always more than happy to accommodate any request. I always make sure the customer is happy with the shoe style and heel height as I know not every can walk in 6" stilettos. I don't always have the right shoes which means ordering them, that takes a few days. Then it usually takes anywhere from a few days to a week to complete depending on the materials I use. Some are easier to work with than others. I prefer to work with comic book paper as it's very easy to manipulate to the curves of the shoe, I use regular paperback books too which are good, then there's annuals and magazine paper which is a bit of a pain but is fine once you get the hang of it. It's important to allow the shoes to dry completely between coats to make sure they stay intact. I always send pictures to the buyer before posting them, this is to make sure they are completely happy with the shoes and also gives them a chance to decide if they want changes or additional details. Do you have any other types of products coming soon? Perhaps boots or bags? 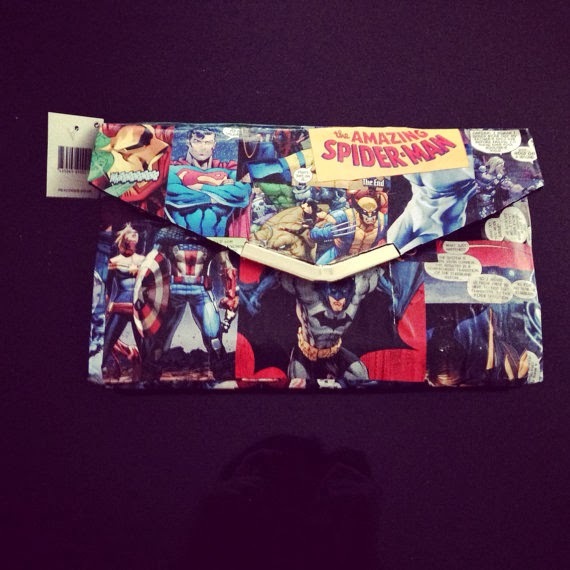 I have already made a few matching clutch bags for a few people previously, I also do purses too which seem to be quite popular. As for anything else I don't currently have any ideas but you never know. Do you have plans to expand and perhaps do wholesale, etc.? I don't think I could keep up with the demands of wholesale. Its just me at the minute and I have on average 2-3 orders a week, sometimes more. There is a lot of dedication that goes into each pair so it would be difficult to mass produce on a regular basis. I do use other sites such as eBay and Instagram, I also finished my own website last week which is now up and running. What else are you hoping to get into? At the minute I'm not sure. I was looking into doing bracelets and bangles not long back but i need to find a supplier that sells the charms in bulk. I know they're out there but its finding the right ones I need which isn't as easy as I thought. With regards to the shoes I plan to start using ankle boots soon then maybe work my way up to knee length boots. Do you have a website? 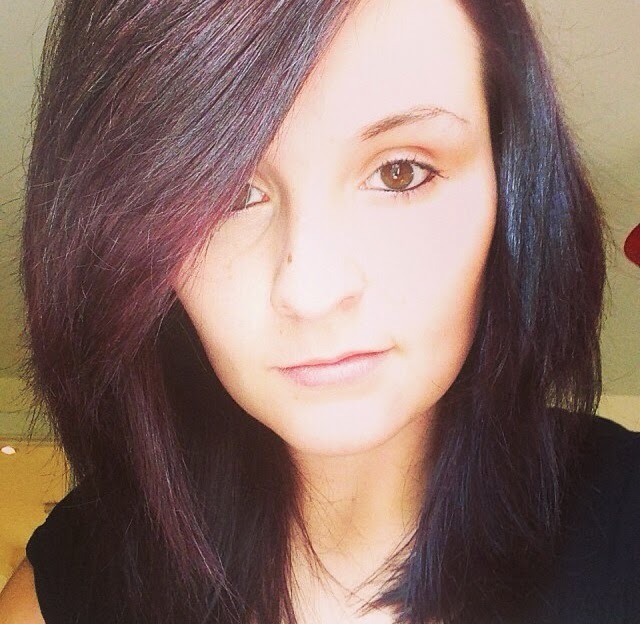 I'd love to be able to see when you're up to anything new!